For the past year Conference Audio Visual have been providing a premium product for the live auction market in both commercial and residential real estate. Supporting the auctioneer to make every onsite auction we attend a real event to remember. Conference Audio Visual provide premium sound systems, a discrete microphone for the auctioneer, LCD screens with live bidding information in multiple currency’s and safety equipment to ensure all the spectators & bidders are safe from the traffic. 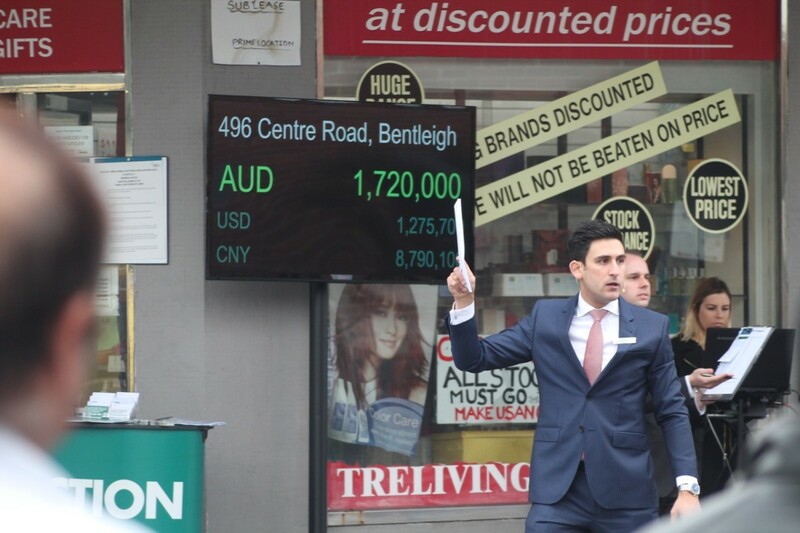 Having delivered many successful auctions, the reactions for the crowd are always so positive as they no longer struggle to hear the auctioneer or miss a bid. On occasions where the property has no power we even supply a silent running generator for all the power requirements. Working closely with the Auctioneer such as Paul Tzamalis from the Auction Company we coordinate auction day setup taking in to account foot traffic, weather, safety of all bidders and public. We have developed a package that minimises our footprint matching the latest state of the art technology with practicality in such dynamic enviroments. Our operators are equipped with Digital Mixers with wireless iPad control this allows the to roam the site during the live auction to ensure audio coverage is optimal for all attendees. Weatherproof PA speakers and premium wireless microphone systems ensure maximum reliability regardless of the location. Our High brightness LCD screens on tall 2m floor standing stands ensure even the people at the back can see the current bid. Our trained staff are experts at working in difficult locations whether it be in the heart of the CBD during a busy lunch time or the footpath of a major arterial road we have the tools at our disposal to deliver a great result. If your organising an event in a challenging location remember we don’t just do conferences so drop us a line we would love to discuss a solution to suit your needs. © 2019 Conference Audio Visual.All Rights Reserved.